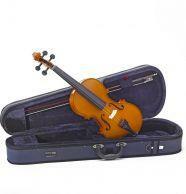 Well respected European made student violin outfit. Andreas Zeller instruments are perfect for students who want a European-made instrument. These violins, violas, cellos and double basses offer outstanding quality and tone. They are made from good quality European tonewoods and produce a pleasing, rounded tone. The high standards of Andreas Zeller compare well against much higher priced instruments. Please note despatch times shown for products are approximations and subject to availability. We will advise an ETA if any significant delay is expected beyond the time quoted.